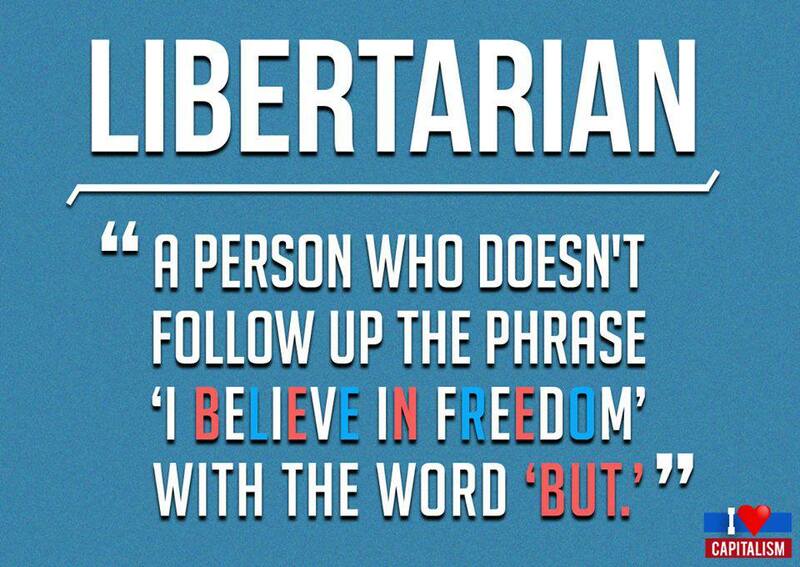 This prompted a commenter to call libertarianism “pure selfishness,” and well, you’ve been on the internet. You know where these things go. Both parties found common ground and readers were witness to a pleasant rational and academic discourse on topic of governance. That didn’t happen. No. Instead, the original poster replied: “how is it selfish to want people to be free?” This led to the objector calling libertarianism “selfishness distilled,” which in turn led to the libertarian declaring ” its about choice over force,” which I can only conclude must be true because it rhymes. And as we all know, all slogans that rhyme… are true all of the time. All these utopian pipe dreams are just a shell game. You can say getting government out of our lives is freedom but historically, it’s never worked out that way for the vast majority of the populous Ultimately, you can’t have a functioning society without establishing certain ground rules, aka compromises on one’s freedom. Otherwise, what you have fails to even be a society in any meaningful sense. That means someone or ones are going to have to step up to take some form of leadership role to make up those rules. And then those rules are meaningless unless someone enforces them. These are the basic building blocks of any social contract. Government at its absolute idealized best serves to ensure fairness between parties under its governance. Government at its absolute worst is fascism. Now what you get when you have government at its most inept is functionally identical to a hard Libertarian state, where the vast majority–and certainly anyone with the great misfortune to be born into a marginalized outgroup–are at the complete mercy of whoever wields the most might, be it through wealth, arms, influence, whatever. And so, while this utopian vision with its grand pronouncements of “freedom” sounds lovely, in actual practice, they’re no less naive as the utopian promises of hard Communists who also built an ideology around getting powerful forces off their backs. I always find it funny that the very tyrants Communists found too oppressive are seen as liberators by Libertarians, and vice versa. Ultimately, neither utopian fantasy solves the fundamental problem of power dynamics. In arguably every social interaction, one party has more power than another party. On a macro-scale we just call that government. And whether that government is made up of elected officials, military conquerors, robber barons, or just charismatic people with social influence, it all, by any other name, still functions in the role of government. Interaction with others simply necessitates rules and compromises…compromises on one’s freedom. But hey, you can always break away from society and go it alone. Then you’ll really be free, right? Nope. Nothing interferes with one’s wants more than the constant demands on one’s time that is securing, maintaining, and protecting their necessities and resources. Sorry, but there simply is no end to the game of thrones. I for one would prefer a society that functioned more like John Rawls’ “veil of ignorance” where the rules are designed in such a way that one would deem them fair prior to any knowledge of what one’s own social position in said society would be. Of course that’s just a thought experiment, but it still sounds like a far more rational way of at least approaching these issues of governance than the extreme polar ideologies of Communism and Libertarianism, who think the solution is trading one form of oppressor with another. You are currently browsing the Skepacabra blog archives for May, 2013.